my bummis diaper kit I won from one of my favorite blogs, Simple Kids! And look what was inside! Look at all of this loot! Inside that big box were 18 organic pre-folds, four covers, fleece liners, flushable liners, a wet bag big enough for the diaper pail, and a sample of detergent and bottom cream! Holy cow, it was like Christmas! I have been using pocket diapers and fitted with covers, but I don't have a full set of pockets (around 10, I think) and the fitteds are larges, which are really too big for him right now. I haven't used prefolds in covers since he was a newborn, and wasn't sure if they would be enough for my big wetter. After they were prepped (you need to wash untreated cotton diapers three or four times to fluff the fibers), I couldn't believe how soft they were! I kept petting them, but could never convince my husband to fondle them, too. Go figure. But I must say that I have had no problems with leaks, and although I usually use pockets at night, I have used the bummis pre-fold with one microfiber insert and had no leaks in the morning. 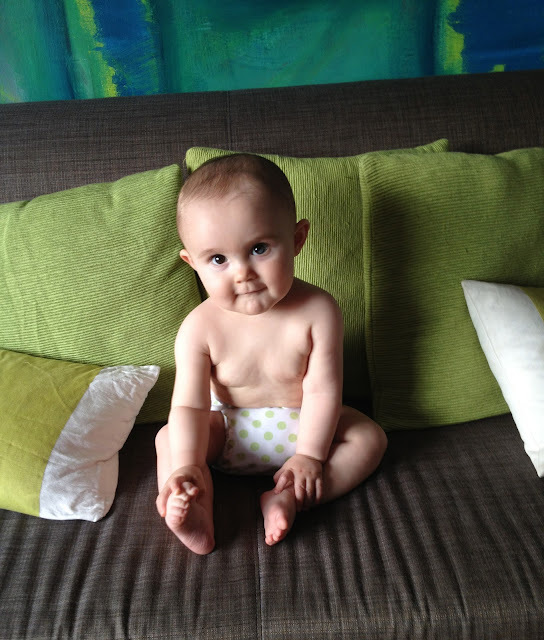 I am impressed by the quality of both the bummis diapers and covers. They have made a velcro convert out of me. Usually, I find that velcro wears out fast and even with laundry tabs, gets stuck to everything in the wash. Three of the four covers in the box were velcro and so far have not stuck to anything except what they are supposed to, and since the Dude is not so laid back during changes anymore, the speed is a definite plus! In the box is also a little booklet about cloth diapering, with details about use and care. Repeatedly, the company urges you to call or email with any questions about use, washing, problems, or questions of any sort. It's an impressive level of customer service, and I think it would be very helpful to first time cloth diaper moms. If you wash every other day, this one box really has everything you need. It was so much more than I expected, and I am so thankful to Simple Kids and bummis for this fabulous gift! I couldn't resist one more action shot, the Dude in bummis with the snap cover. My goodness he is so cute in the pictures! How precious!